A setting which began a dream come true for Lucy Maud Montgomery when she was born in this heritage house in Prince Edward Island, Canada. 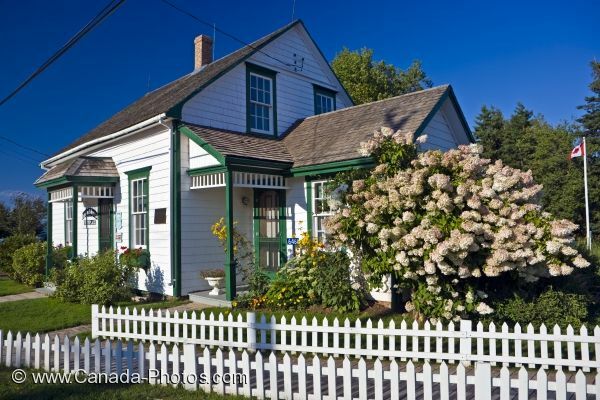 This heritage house painted green and white with a white picket fence surrounding the garden is where Lucy Maud Montgomery, author of Anne of Green Gables, was born in 1874. Restored and kept in immaculate condition, this heritage house is open to the public when visiting Queens in Prince Edward Island, Canada. Birthplace of Lucy Maud Montgomery, author of Anne of Green Gables, in New London, Blue Heron Coastal Drive, Queens, Anne's Land, Prince Edward Island, Canada. LM Montgomery was born in this house in 1874. Picture of the white picket fence that encompasses this heritage house in Prince Edward Island where L.M. Montgomery was born.